Spending the latter years of the Great Depression serving in the U.S. Navy, Fred Hoechst Jr. returned to St. Louis following his discharge in March of 1940 to embark upon life as a civilian. Although the previous four years had granted him a worldwide adventure aboard the battleship USS Colorado, little did Hoechst realize he would again don a sailor’s uniform after the country was drawn into war. 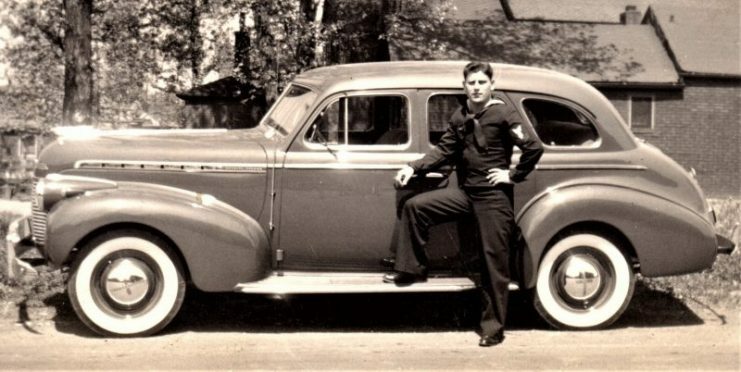 In the months after leaving the service, the veteran began working for Laclede Gas and used some of the money he saved to purchase a 1940 Chevrolet. The following year he and his fiancée, Ruth Gieson, were married before a justice of the peace in Imperial, Missouri on February 19, 1941. Weeks later, he went to work for the National Lead Company in south St. Louis. Hoechst was caught up in the patriotic furor gripping the nation and made the decision to return to the U.S. Navy to apply his peacetime naval skills in potential combat. Enlisting on March 25, 1942, he was assigned to the engine room of a ship that would enter service several weeks later—the USS Meade (DD-602). 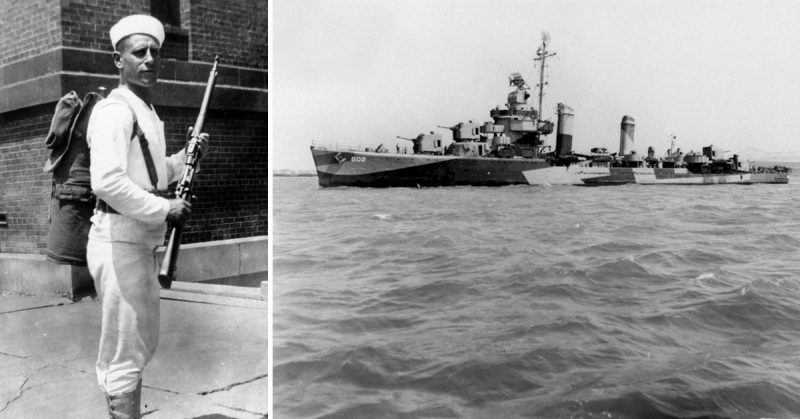 After serving four years in the Navy aboard the USS Colorado, Hoechst received his discharge in March 1940 and returned to St. Louis to begin life as a civilian. Weeks after the Pearl Harbor attack, he re-enlisted and went on to serve in WWII aboard the USS Meade. The U.S. Navy destroyer USS Meade (DD-602) off New York City, 1942. 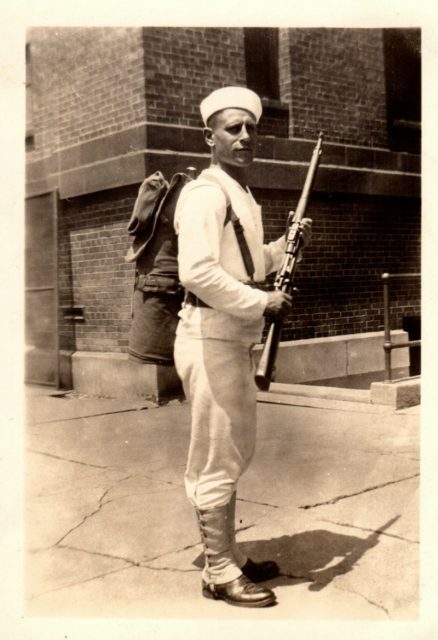 Hoechst ascended the enlisted ranks, eventually becoming one of only fourteen chief petty officers assigned to the ship. In the early weeks after their arrival in the Pacific, he and his fellow sailors kept the engines in optimal condition through the Battle of Guadalcanal in November 1942, during which Meade destroyed four Japanese transports and rescued 285 American sailors whose ships were sunk. Naval records reveal that the Meade received only a momentary break from the action as she again sailed for the South Pacific, arriving in Wellington, New Zealand on October 29, 1943. The ship escorted U.S. Marines of the V Amphibious Force to the Battle of Tarawa the following month and again engaged in shore bombardments. Danger abounded for the crew when contact with a submarine “was made on 22 November,” noted the souvenir booklet printed for sailors of the Meade. “With the assistance of the USS Frazier the sub was brought to the surface with depth charges, shelled and sunk,” resulting in the capture of one Japanese sailor. Meade then sailed for Pearl Harbor to prepare for a return to the West Coast to undergo a major overhaul, but was rerouted to provide close fire support for the Battle of Kwajalein in the Marshall Islands in early 1944. 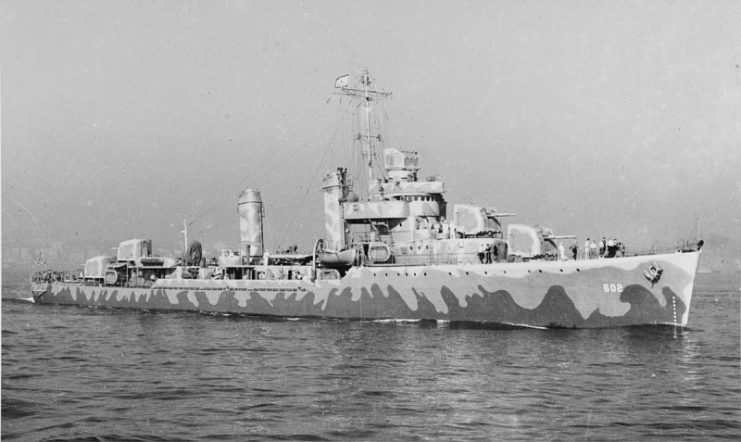 Throughout the next several weeks, Hoechst and the crew of the Meade became part of Task Force 58 and were engaged in attacks against Pacific locations such as Palau, Yap, Hollandia, Truk and Ponape (Pohnpei). They were detached from the task force in April 1944 and began patrolling islands controlled by the Japanese. 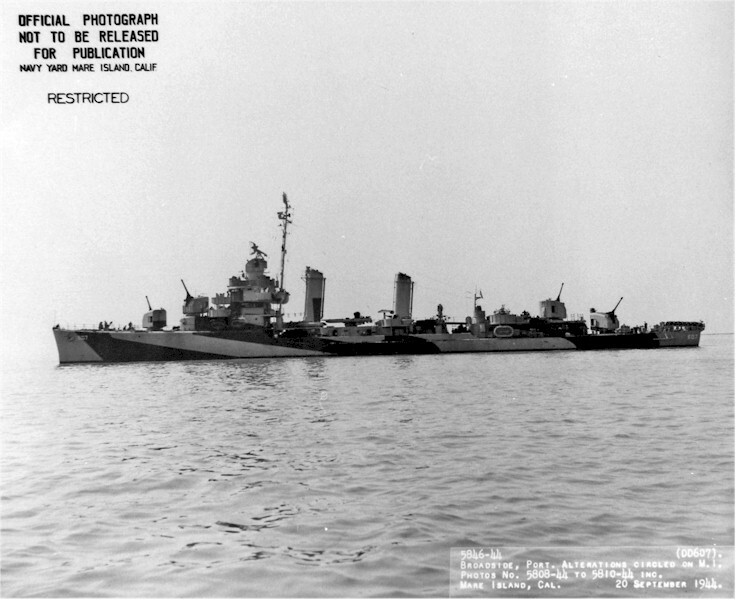 USS Meade (DD-602) in San Francisco Bay, California, 11 September 1944. 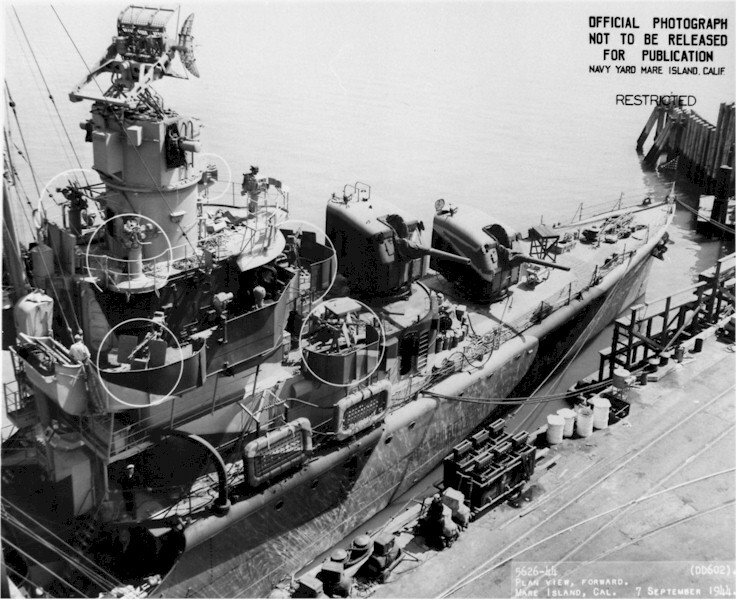 The closing of Hoechst’s combat service approached when Meade received orders to report to the West Coast for a much needed overhaul in July 1944. 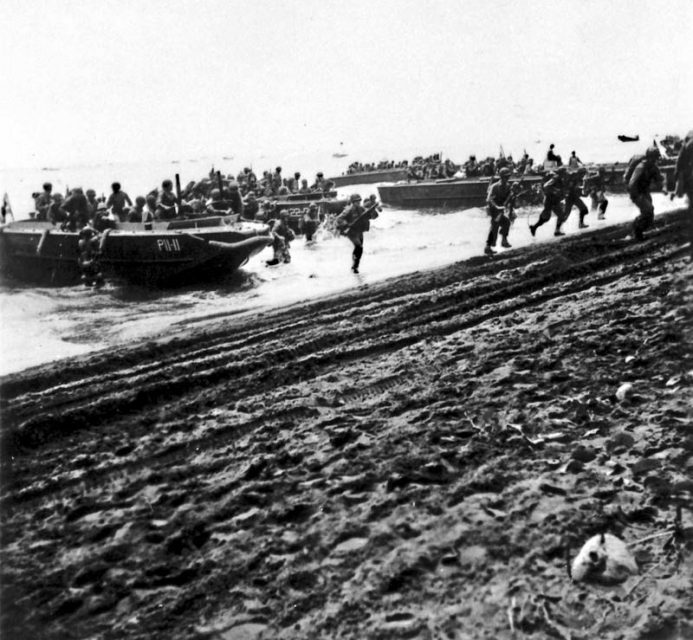 Months later, they completed a shakedown and were sent to provide shore fire support during the liberation of the Philippines in the waning weeks of the war. 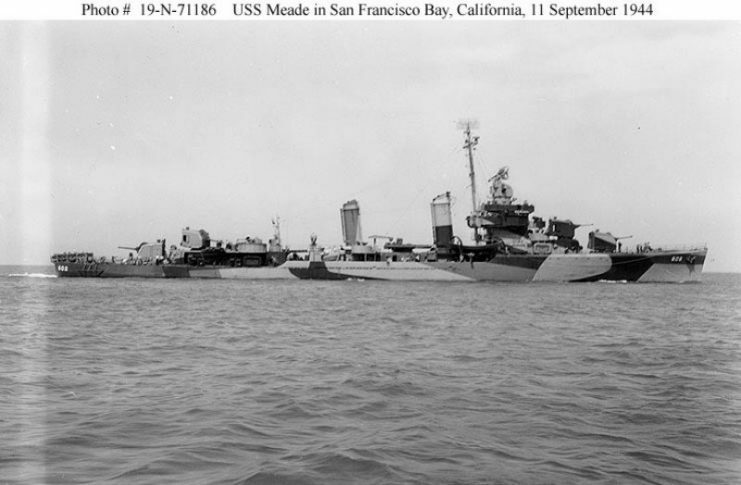 USS Meade (DD 602) at Mare Island on 7 Sep 1944. The Japanese surrendered on September 2, 1945, and Hoechst received his discharge the following month on October 25, 1945. 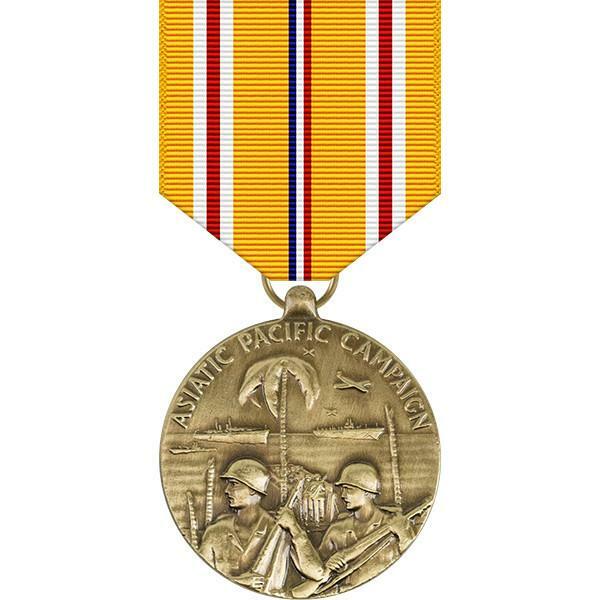 During his naval career, he completed nearly 7.5 years of active service and earned an at Asiic-Pacific Campaign Medal with 9 stars, which represented his participation in 9 campaigns of the war. After coming home to St. Louis, Hoechst returned to the National Lead Company, from which he would retire decades later. He and his wife raised one son, Jerry, and in their retirement years enjoyed bowling and traveling. Upon his passing in 1995, he was laid to rest in Jefferson Barracks National Cemetery. 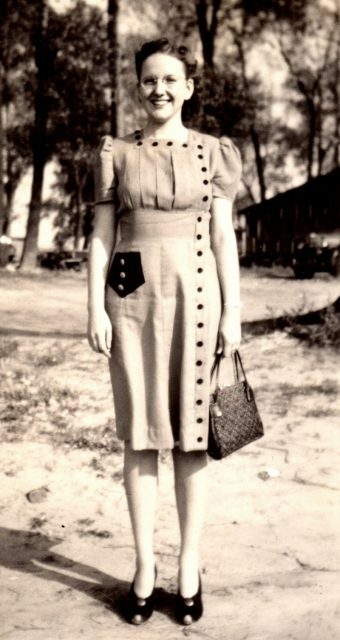 Hoechst is pictured while in basic training in the summer of 1936 at the recently re-opened Great Lakes Naval Training Station. Courtesy of Judy Thompson. A famed painter once explained that men like Hoechst were a dedicated type of individual. Through his actions, he demonstrated that sailors and those who embraced a life on the sea possessed a uniquely brave perspective. Despite being faced with the hardships of a life on the water, they never made excuses to avoid embarking upon a nautical journey.